EPRI NDE Center, 1300 Harris Blvd. New nondestructive evaluation (NDE) equipment has recently been developed which will aid in detection of flow-accelerated corrosion (FAC) or other wall thickness degradation by reducing the costs associated with the examination. The cost of monitoring piping systems for FAC continues to be an important issue for utility NDE staff. Pipe wall thinning due to FAC has resulted in leaks and ruptures in primary and secondary piping systems when not identified at an early stage. Ultrasonic examination methods (or radiographic examination methods for small diameter piping) are typically used to detect and monitor FAC in electric power generating plants and typically involve a multi-step process. The examination process includes removal of insulation, the layout of an inspection grid, acquisition of thickness measurements, and input of the data into an evaluation program such as Checworks. The evaluation program is typically used for predicting repair, maintenance, and the appropriate corrective action to take for the particular situation. Insulation removal, disposal, and replacement can account for higher costs than the actual NDE, particularly where asbestos insulation is used. As well, grid layout typically constitutes a large portion of the FAC monitoring costs. Several utilities have reported that they spend more time laying out grid patterns than they do acquiring the thickness measurements. The elimination of removing insulation and/or of producing a grid on components prior to examining for FAC can reduce the cost of the inspection by more than 50%. Two devices to assist utilities with examination of their primary and secondary piping systems for FAC and their service water system piping for wall thinning degradation have recently been developed. The first device is a real-time, digital radiographic examination system that utilizes a linear array of solid state detectors, rather than film, to measure wall thickness of insulated or uninsulated piping systems. The second device utilizes a personal computer (PC) to generate a virtual grid pattern (which is displayed on the PC screen) along the piping component surface and uses airborne audible sound to locate the transducer position, relative to the virtual grid (1, 2). The development of a real-time, digital radiographic system for the detection of corrosion or wall thickness degradation in piping systems increases the speed of examination and eliminates the need for removal of piping insulation (1, 2). 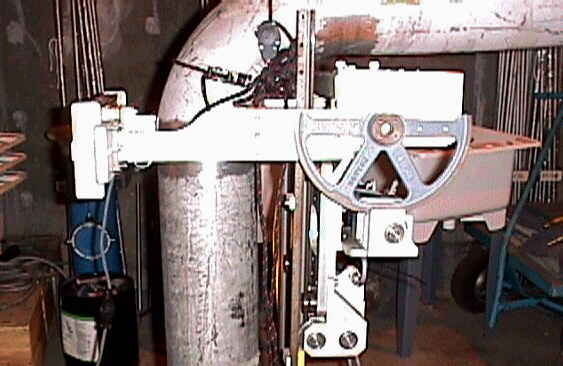 The ThruVUTM system includes a linear array of solid state detectors and a low intensity Iridium-192 gamma ray source mounted on a computer-controlled, robotic crawler to measure wall thickness of insulated and uninsulated piping systems. The individual detectors of the array measure the intensity of the gamma rays after passing through the insulation, the piping walls, and the substance contained within and transported by the pipe. The output of the array is connected to a per onal computer in order to measure and display actual thickness values instantaneously. The system examines piping systems at a rate of up to 5 feet per minute and does not require development of film (3). A device to assist with examination of piping systems for wall thickness degradation due to erosion-corrosion, FAC, microbiologically-induced corrosion, and other wall thinning mechanisms has recently been developed. This evolving device is a real-time, digital radiographic examination system which utilizes a linear array of solid state detectors (rather than film) to measure wall thickness of insulated or uninsulated piping systems as shown graphically in Figure 1. Fig 1: A conceptual sketch showing application of the digital radiographic system on piping. The EPRI NDE Center and the Petroleum Environmental Research Forum (PERF) previously evaluated an on-line, real-time radiographic examination system (ThruVUTM) developed by Omega International Technology, Inc. The ThruVUTM system uses a linear array of solid state detectors to measure wall thickness of insulated or uninsulated piping components. A low intensity IR-192 gamma ray source is located on one side of the piping component and a solid state detector array is mounted on a robotic scanner diametrically opposite the gamma source to measure the intensity of the gamma rays after passing through the insulation, the pipe, and the product inside the pipe. The output signal of the detector array is connected to a high-speed laptop PC to collect and analyze the data in real-time as the robotic scanner travels along the piping system. The system measures, computes, and provides the actual thickness values instantaneously at the rate of up to 5 feet per minute (3). Omega International Technology has developed an excellent detector array, but is not in the business of providing commercial NDE services. Southwest Research Institute (SwRI) was selected as the contractor to upgrade ThruVUTM by designing and fabricating scanners for the examination of elbows, horizontal piping in piperacks, vertical piping, and for tangential examination of piping; developing a robust scanner control system that provides a clear interface to the detector software and an encoder that provides accurate position information; upgrading the software to provide all necessary site information, a 256 color display, print drivers for the B-scan presentation, optical database output, and PC-based software for customer analysis; and provide greater shielding of the radiation source to minimize the exclusion zone required during operations. The upgraded device was jointly funded by EPRI and PERF and will provide the necessary examination documentation, while performing rapid screening for wall thinning and maintaining a radiation exclusion zone of less than 20 feet, when a weak Iridium source is available. 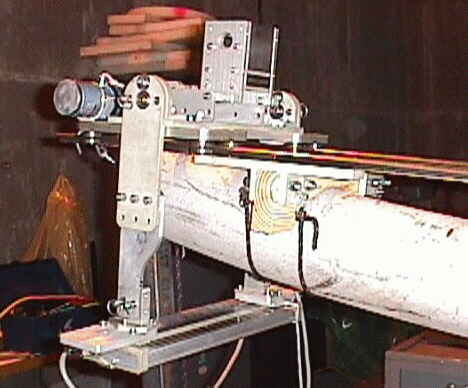 A picture showing how a motorized scanner is to be implemented with this system is shown in Figure 2 for straight sections of insulated piping. The radiation source and detector array are mounted on a drive track which travels along the length of the pipe. Figure 3 shows a picture of the motorized scanner for elbows. In this application, the detector array moves along the extrados of the elbow, while the source remains fixed at a prescribed point. When pipe wall thinning is detected, it is frequently desirable to measure the amount of thinning and to identify where around the pipe circumference the thinning is located. A tangential scanner can be used to measure this thinning. 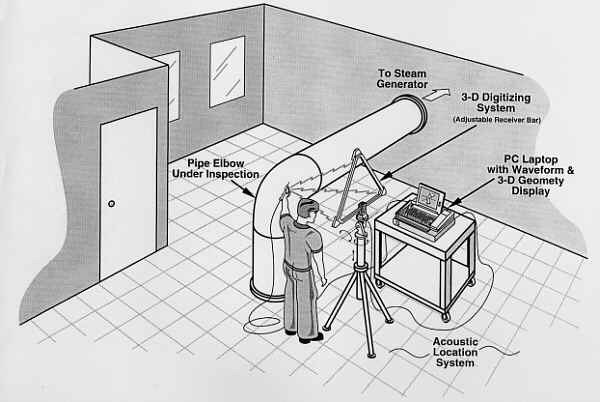 The tangential scan allows transverse movement of the source and detector such that an image of the pipe inside wall and outside wall is shown. Figure 4 shows the tangential scanner. In this figure, the source is aligned such that the main portion of the radiation beam is passing by the inner wall. Further movement of the source (downward in Figure 4) would position the source such that the outer wall is imaged. The operator would then physically measure the distance between the outer and inner walls on the image and would know the wall thickness at that location. The scanner could be moved upward to obtain a similar measurement of the wall 180 degrees from the first, or rotated 90 degrees around the pipe to obtain the wall thickness at 90 and 270 degrees from the first measurement location. The real-time digital radiographic system allows thickness mapping, assessment of corrosion through insulation, and rapid scanning to assess the general condition of the component. Its strengths lie in detailed thickness mapping through insulation and an anticipated reduction in cost of 60% over conventional radiography. It also provides a means of global scanning for screening systems for thickness degradation when used on straight sections of piping and requires a much smaller radiation exclusion zone than does conventional radiography. During field trials of the ThruVUTM system, as much as 250 feet of pipe have been examined in a 10-hour shift. Field trials were conducted by EPRI and PERF members during August and September 1998. The system functions very well technically. There are still some logistical and commercial concerns to address before the system is available on a commercial basis. It is anticipated that these concerns will be satisfied and the ThruVU TM will be available in November 1998. The NDE Center has also funded SwRI to design a system (AutoGrid) to automatically produce a grid and record the thickness of piping. SwRI has had previous success with locating position via airborne, audible sound and produced systems for the US Navy to measure and record pipe thicknesses in 1978 and the US Air Force to examine aircraft wings in 1986. The system utilizes two spark emitters attached to the ultrasonic transducer and an array of microphones located on a triangular arrangement. The velocity of sound in air is then used to locate the transducer via triangulation with 2 or more microphones. This technology is combined with a virtual grid pattern generated by the PC along the piping component surface. The virtual grid pattern is displayed on the PC and not on the actual component. Airborne audible sound is used to locate the transducer position relative to the virtual grid and guide the operator to the grid locations. Ultrasonic interface is added to the PC along with a pulser/receiver card. The thickness data is recorded at the grid locations (or any additional locations as determined necessary by the operator) and then input to Checworks for analysis. An artist's rendition of the AutoGrid system in laboratory use is depicted in Figure 5. This device should reduce the total time of inspection by eliminating the need for a grid layout. Utilities typically expend up to 7 man-hours per component marking grid locations and may need to mark grids on 30 to 50% of the 50 to 100 components examined in an outage. The computer-generated, virtual grid will also improve the accuracy of the placement of the grid and improve location accuracy from outage to outage. It also allows flexibility in grid patterns, spacing variations, and component variations. The identification of a thinned area may necessitate reduced grid spacing, which can be accomplished almost immediately with the PC and then the PC can identify which grid locations have not yet been measured. 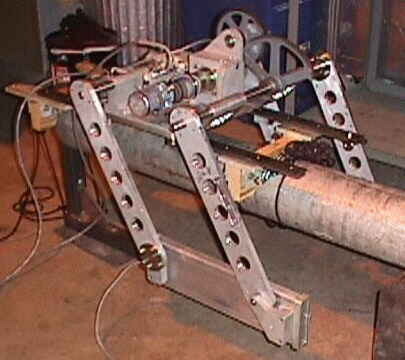 A fieldable prototype system was completed and available for demonstration purposes in April 1998 for simple cylindrical components. The second phase (a fieldable prototype system for more complex geometries to include tees, reducers, and elbows) was completed and available for the first field trial in August 1998. Following the first field trial, improvements were made to the prototype to add a heads-up display and to refine and ruggedize the system for commercial use. It is anticipated that each participating utility would purchase 2 to 5 of these systems and utilize in-house inspection personnel to provide the examinations. NDE staff continues to consider the cost of monitoring piping systems for wall thickness degradation to be an important issue in plant or system maintenance. Pipe wall thinning has resulted in leaks and ruptures when not identified at an early stage. Ultrasonic or radiographic examination methods are typically used to detect wall thinning and monitor piping wall thickness, and generally involve the removal of insulation, acquisition of thickness measurements, and input of the data into evaluation programs for predicting repair, maintenance, and corrective action. This process is typically costly and quite time consuming. The development of new NDE methodology that can reduce the costs associated with these examinations will be of great benefit, while simultaneously increasing the accuracies associated with the examinations. Walker, Stan M., "New NDE Developments Support Rapid, Economical Screening for Flow-Accelerated Corrosion," presented at the 6th International Conference on Nuclear Engineering, San Diego, CA, May 10-14, 1998. Walker, Stan M., "New NDE Developments Support Rapid, Economical Screening for Flow-Accelerated Corrosion," presented at the ASME/JSME Joint Pressure Vessels and Piping Conference, San Diego, CA, July 26-30, 1998. Gupta, Nand K., Goyal, Vijay K., and Gupta, Kamal K., "In-Service Inspection of Insulated Pipelines," presented at the American Nuclear Society's Seventh Topical Meeting on Robotic and Remote Systems, Augusta, GA, April 29, 1997.